To understand the spiritual implications of Nehemiah’s story we need to set the man into the history of Israel. Second Chronicles 36 describes the fall of Jerusalem into enemy hands. About 600 BC God allowed His people, the Jews, to be taken captive by the Babylonians because they had defied His will and openly disobeyed His commands (2 Chr. 36:14). This brought judgment, ruin and slavery upon them, and “there was no remedy” (2 Chr. 36:15-19). They had exhausted God’s patience and now His love worked against them. His words of impending judgment delivered by prophets were fulfilled (Jer. 25:8-11). These are solemn thoughts for God’s people today. We must never presume on the apparent tameness of our God. We must never treat sin lightly. Ultimately God’s righteous anger will deal with all sinful behavior, including ours. Nehemiah was one of the descendants of these captives. He was in royal service in Babylon to Persian King Artaxerxes. God had used the Persians to overrun the Babylonians for their ruthless barbarity. God can use anyone to achieve His purposes. Although Nehemiah didn’t yet know it, he was given a place close to the king by God so He could use it to bring salvation and renewal to His devastated people. He never forgets His promises (Jer. 25:12-14). God the Judge is also the Savior. He places His people where He can use them. With this background in mind let’s apply Nehemiah’s work to ourselves today. There was a group of people who knew the situation surrounding Jerusalem. They were the survivors (Neh. 1:3) who had seen the beginnings of rebuilding under Cyrus and Ezra (Ezra 1:1; 3:1-3; 3:10-11; 4:24; 6:14-16). The temple was finished and in some use, but the defensive walls to the city were in ruins. While we don’t know much about this remnant who went “home” from time to time, from Susa to Jerusalem, we do know that the report Hanani shared with Nehemiah caused this spiritual man to be broken in the presence of God for many days (Neh. 1:4). Nehemiah is a good example of one seeking to know God’s will for a particular place and people. Not content to be ignorant, he informed himself as much as he could (1:2) and compared what was with what should have been. The city which should have been declaring God’s glory was broken down (1:3). As he spent time talking with God about the broken walls his burden became “what my God had put into my heart to do for Jerusalem” (2:12). God broke Nehemiah’s heart so He could use him. The meaning of his name, “God was comforted,” was proven true. This timely sharpening of his spiritual senses became the driving force for his life’s work. The more he allowed himself to be broken by God the clearer his vision became. The cost was counted and Nehemiah was ready to pay the price to do God’s work. Nehemiah sacrificed his royal appointment to a king for a rough laboring job at his ancestral home. He was still 800 miles away from Jerusalem’s ruined walls, but the rebuilding began when he determined in his heart to do it. We read of him praying and hearing God say, “Gather them from there and bring them to the place I have chosen” (1:9). Are we obedient to God’s call? Nehemiah saw a need. He first went to God about it and then made himself available to meet it. He continued as cupbearer and waited on God’s timing while still carrying God’s burden. Waiting is often God’s way to start His work. Waiting for God is not doing nothing! The royal cupbearer was being watched by the king who saw him as honest and hardworking. Nehemiah was gaining respect and trust. After months of bearing this burden, God brought Nehemiah’s well-controlled “sadness of heart” (2:1-2) into the king’s view. Nehemiah had been fasting in private (Mt. 6:16-18) and God now rewarded him with the chance of a lifetime. When the king asked him three questions: “Why? … What? … How?” (Neh. 2:2,4,6) he had the answers already prepared – but was still “very much afraid” (2:2). However, he showed his great faith by asking both God and the king for backing for the pilgrimage to rebuild Jerusalem’s walls (2:3-5). There is nothing unspiritual about being scared. When God works people are often afraid – even God’s people (Ex. 3:6; 1 Chr. 13:12; Lk. 2:10; Mk. 16:6). Nehemiah spoke, believing that God would open the way for his God-given burden to be achieved. His prayer and his preparation worked together to uncover “the gracious hand of God upon (him and) the king granted all his requests” (2:8). Armed with letters of authority and with the raw materials he needed, Nehemiah began God’s mission for his life. He left his good job and all the security it brought him, and journeyed to Jerusalem. After a nighttime reconnaissance of the broken- down walls, his burden was still a secret between him and God. But never underestimate the potential of a man with the counsel of God in his heart. There were plenty of Jews living in the ruins of Jerusalem, but only Nehemiah had received the rebuilding burden from God. He had counted the cost, considered his options, and counseled with God alone. The few men who surveyed the walls with Nehemiah were still not privy to his plan (Neh. 2:12). He showed them the need, trusting God to call them to share his burden. The local authorities were not involved yet (2:16). Only after selecting a team of burdened workers was the plan revealed. Rushing God’s work may lead to ruin. A wise builder keeps in line with God (Rom. 13:1-5). The word “examining” (2:13,15) is a medical term for probing a wound to determine the extent of the damage. During this process God was working in the hearts of Nehemiah’s team so they could become as concerned as he was. Concern leads to commitment. We see the leader pointing out the need and identifying with it: “You see the trouble we are in … ruins … burned with fire” (2:17). When he invited them to work with him, their response was, “Let us start rebuilding” (2:18). God’s men using His means to accomplish His work will never be deflected by those who “mocked and ridiculed” (2:19). The only words that count are those of God and of His appointed leaders. “Come, let us rebuild,” he challenged (2:17). “Let us start rebuilding,” they replied (2:18). “We (God’s) servants will start rebuilding” (2:20). In answer to prayer, God had given Nehemiah a burden, a team of builders and boldness. Chapter three summarizes the rebuilding work. God’s work involved a lot of people in a lot of hard work. Those who think that because God is doing a work we need do nothing, should learn much from this chapter. God was rebuilding Jerusalem’s walls by the sweat of a workforce of His people. Construction words appear forty-two times in thirty-two verses. And another group of words tells us how important it was for the rebuilders to work “next” to each other. Any gap in the wall would render all the work of everyone else valueless. I see in this a commentary on participation in the local church which “grows and builds itself up in love, as each part does its work” (Eph. 4:11-12,16). Under God’s direction responsibilities are allocated through His servant-leaders. Another important thought is that of each rebuilder working “in front of … next to … beside his house” (3:23). Every work of God should begin at home and work out from there. Loving our neighbor begins with the “next door” meaning of that word. We must begin rebuilding in the street, college dorm, office, factory or prison cell – wherever God has placed us. Nehemiah 3 also tells us that rebuilding work was done by “priests … goldsmiths, perfume makers … and the merchants” (3:28-32). No one could say “That’s not my skill” or “I can’t leave my business.” Several rulers, sons of rulers and community leaders – such as Baruch who “zealously repaired” his section of the wall (3:17-21) – were cited as examples of those who took on a new role for God. Unfortunately some “nobles” thought themselves above supervision. They were a danger to the rebuilding because they “would not put their shoulders to the work” (3:5). They put human rank above service for God. Jerusalem’s wall was a real community effort with the majority working well together. Some rebuilt the old while others built new from scratch. This can be an example to our churches today. Why have either all “old” or all “new” when, with a little care, “both” can serve together? In chapter four the opposition mentioned earlier (2:10,19) is expanded. The devil used people outside and inside the workforce to hinder God’s work. He even tempted our Savior at the beginning of His redemptive life on earth (Mt. 4:1-11). When he attacks, remember the Holy Spirit and God’s Word are our defensive and offensive weapons in the spiritual struggle (Eph. 6:10-18). I see several struggles for Nehemiah. Human vs. Divine: In the first, Sanballat and Tobiah were thinking humanly about the king while Nehemiah’s heart and mind were fixed on the divine, sovereign God (2:19-20). God’s servants must keep God in clear focus (Heb. 12:2-3). The world sees things differently from God. Ridiculing vs. Rebuilding: The second confrontation was based on ridicule (4:1-6). What Sanballat and Tobiah heard was correct; their hot response revealed that their desires were being challenged by God’s work. They made disparaging remarks about Nehemiah, his team, and their work. They wanted to draw Nehemiah’s focus away from God and on to other things. But God’s workers must have Christ’s attitude: He “made Himself nothing” and “humbled Himself” (Phil. 2:5- 8). We are warned to expect persecution (Mt. 5:10; Rom. 8:35-37). 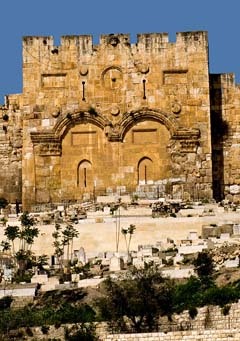 Nehemiah’s response was to pray and continue rebuilding in spite of the opposition (Neh. 4:4-6). Evil Alliance vs. Good Guard: The third confrontation was with an alliance of evil that “sought to stir up trouble … and put an end to the work” (4:7-11). Though the opposition appeared overwhelming, Nehemiah responded by praying and posting a guard. This wasn’t a lack of faith, but spiritual common sense that encouraged the workers. They were determined to keep matters in God’s hands and use their hands for His work. Man’s Threats vs. God’s Assurance: The fourth confrontation came from more discouraging threats (4:11-23). In response, Nehemiah told the workers to “Remember the Lord, who is great and awesome” (4:14). With their attention firmly fixed on God the people took precautions and continued their work (4:16- 18). If the work stopped the devil would win. Nehemiah’s stirring messages and personal example inspired confidence in his team (4:19-23). Compromise vs. Confidence: The fifth confrontation occurred when Sanballat and his cronies presented Nehemiah with an alternative plan: “Come, let us meet” (6:2). But Nehemiah saw that “they were scheming to harm me” (6:2). One of the greatest signs of maturity in leadership is the ability to say “No.” Like dripping water, the opposition persisted in trying to get Nehemiah to compromise. Exaggerated rumors were spread through an open letter (6:7). The workers became the enemy’s target because Nehemiah was impossible to beat. He asked the all-knowing God to “strengthen my hands” (6:9). He knew where real power and authority were found. Fear vs. Faith: The final confrontation (6:10-14) was a spiritual- sounding alternative: “Let us meet in the house of God … because men are coming to kill you” (6:10). His life was in danger, but spiritual discernment led him to conclude that this was false prophecy (6:12-13). He knew God could speak through a prophet, but he also knew that not every prophecy was from God (6:14; 1 Jn. 4:1). Answered prayer, and knowing that God was in the work, enabled Nehemiah and his team to complete the work “in fifty-two days” (6:15-16). The best way to defeat the enemy is to work consistently to get the job done. The wall was a testimony to God, seen and respected even by the surrounding nations: “When our enemies heard about this, all the surrounding nations were afraid and lost their self-confidence, because they realized that this work had been done with the help of God” (6:16). Like Paul later, Nehemiah and the wall rebuilders could say: “I will boast all the more gladly about my weakness, so that Christ’s power may rest on me … For Christ’s sake, I delight in weaknesses, in insults, in hardships, in persecutions, in difficulties. For when I am weak, then I am strong” (2 Cor. 12:9-10).